The MJO is a mode of sub-seasonal atmospheric variability that influences the location and strength of tropical precipitation. It moves eastwards through the atmosphere and its effects are visible over the warm parts of the Indian and Pacific oceans. It takes the MJO about 30-70 days to travel around the equator. It can interact with other tropical phenomena including ENSO and the Indian Monsoon and it impacts precipitation in mid-latitudes. Scientists are currently studying the processes involved in the MJO, MJO impacts and how to better model it in "General Circulation Models (GCMs)". The purpose of this page is to provide ways to assess and view the current MJO status. In addition to the types of plots here, we hope to provide as assessment of the current status of the various model's MJO's. This could be done using EOF's of the models or similar techniques. ROMI phase diagram for the latest 90 days. See related information here. Shows the current value of the phase diagram of EOF1 versus EOF2. The EOF's were calculated by using the combined daily fields of 15?S-15?N averaged OLR, 850 hPa zonal wind, and 200 hPa zonal wind from 1979 to 2001. The interpretation of EOF1 and EOF2 is available pictorially. Displays a 5-day running mean of 200mb velocity potential averaged from 5N to 5S. Events can seen to be traveling west to east, generally speaking. Animation of daily IR and 200-hPa velocity potential anomalies (base period 1971-2000). Velocity potential anomalies are proportional to divergence with green (brown) contours corresponding to regions in which convection tends to be enhanced (suppressed). PSD is creating a set of MJO timeseries that quantify current and historic MJO activity. The links and descriptions are below as well as links to some other MJO timeseries created at other institutions. A description of the timeseries format is available. NOTE: OMI has been updated through August 28, 2018. These PCs will differ slightly from the previous version since the sample used for the 20-96 day filter is longer (1979-2018), resulting in slightly different values for the filtered OLR. The EOFs used are still from 1979-2012 (see below). The previous (1979-2012) version of OMI can be obtained here. NOTE: When comparing OMI directly with RMM, to obtain the proper phase the sign of OMI PC1 and the PC ordering should be reversed, so that OMI(PC2) is analogous to RMM(PC1) and -OMI(PC1) is analogous to RMM (PC2). Daily MJO index time series from 1979. Kiladis G.N., J. Dias, K.H. Straub, M.C Wheeler, S.N. Tulich, K. Kikuchi, K.M. Weickmann, M.J. Ventrice. A comparison of OLR and circulation based indices for tracking the MJO. Monthly Weather Review, May 2014, 142 1697-1715. Ventrice et al. A Modified Multivariate Madden-Julian Oscillation Index Using Velocity Potential. Monthly Weather Review, December 2013, 141, p. 4197-4120. Composite streamfunction and OLR patterns for RMM and OMI based on the events that exceed 1 standard deviation for each phase of the PC combination. These are based on data from 1979 through 2012, and the number of events in each composite is given as "N= " at the bottom of each plot. Blue shading denotes negative OLR anomalies (regions of convection) and red positive (suppressed), with two levels of shading at +- 10 and +- 6 W/m**2. Streamfunction contour interval is 5 X 10**5 m**2/s at 200 hPa, and 2 X 10**5 m**2/s at 850 hPa. To facilitate comparison with RMM, these composites are constructed by reversing the sign of OMI PC1 and the OMI PC ordering, so that OMI(PC2) is analogous to RMM(PC1) and -OMI(PC1) is analogous to RMM(PC2), as described in Kiladis et al. 2014. The ASCII EOF values are available via ftp for EOF1 and EOF2 . They can be read using the code read.eof.f. User can retrieve the files via the web or using an (anonymous) ftp client at the address ftp.cdc.noaa.gov. Then, cd to /Datasets.other/MJO/. An animation of the daily OMI EOF's (realtime player format). The VPM EOFs are computed using zonal wind and velocity potential based on NCEP reanalysis version 1 from 1979 to 2012. The ASCII FMO EOF values are available from here. ROMI phase diagram for the latest 90 days. To plot the diagram in the same phase space as the Wheeler-Hendon RMM index, the sign of ROMI PC1 is reversed and the PC ordering is switched, so that ROMI(PC2) is analogous to RMM(PC1) and -ROMI(PC1) is analogous to RMM(PC2). See Kiladis et al. 2014, available above, and the RMM home page linked below for details. VPM phase diagram for the latest 90 days. The VPM index was computed using zonal wind and velocity potential based on the NCEP/NCAR Reanalysis Version 1. The VPM PC signs were adjusted to match the RMM index signs for the phase plot. Other MJO indices and MJO information. The All-season Real-time Multivariate (RMM) MJO Index (Wheeler-Hendon) from the The Centre for Australian Weather and Climate Research. Bimodal ISO Index for historical data analysis and real time monitoring from the International Pacific Research Center. The NOAA/CPC MJO page: Contains monitoring maps and plots, data and forecasts. Adrian Matthews MJO page: A very complete page with MJO description, current research topics, illustrations and animations from Adrian Matthews at the University of East Anglia. Carl Schreck's analysis of the RMM components. A MJO tutorial from the University of Wyoming. An MJO Primer: What is an MJO and how does it affect the weather? a. What is an MJO? from Rol Madden and Paul Julian. Typically the convectively active stage of an MJO starts over the equatorial Indian Ocean and moves slowly eastward at 3-5 m/s toward the west and central Pacific Ocean. The active stage is followed by a convectively suppressed stage and together they give rise to precipitation anomalies (i.e., departures from normal) that have a "dipole" structure. The "cycle" repeats itself approximately every 5 days. Sometimes the debris from a previous event starts a new MJO over the Indian Ocean. A composite OLR animation illustrates the typical sequence of precipitation anomalies during an MJO (courtesy of Adrian Matthews). The MJO was first described in 1971 but a field project held over the west equatorial Pacific during 1992-93 raised awareness of the MJO as a coherent phenomenon, possibly useful for weekly predictions of tropical precipitation and extratropical weather patterns. The MJO is best defined over the oceanic warm pool, which extends from the Indian Ocean to the central Pacific and where complex variations of precipitation occur from day to day. The warm pool is generally defined by sea surface temperatures that are > 28C. As a result of this intense activity, the MJO is sometimes difficult to see in a sequence of satellite pictures of the Tropics. This link shows a satellite animation of a strong MJO that occurred during December 2003 to January 2004. Note the non-steady or transient nature of the convection, some of which can be seen more clearly when the data are averaged in space or time. Ways to monitor the MJO are illustrated later. b) How can an MJO affect the weather? from Sardeshmukh and Hoskins illustrates the phenomenon for the situation where the "base state" atmospheric circulation is extremely simple. The picture shows upper atmospheric ridges and troughs emanating from a region of "precipitation" forcing over the west Pacific and extending poleward into both hemispheres. The circulation features can alter the path and intensity of synoptic waves in mid-latitudes and thereby can affect the weather. 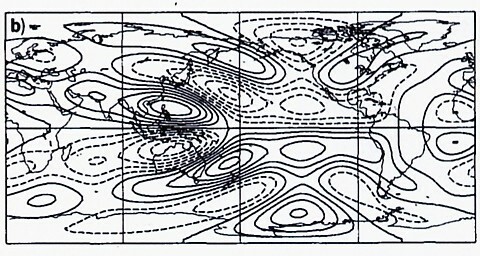 The actual "base state" through which these Rossby waves propagate is very complicated, involving jet streams, storm tracks and other regional circulation features. These features channel or interact with the Rossby wave energy and result in a pattern of troughs and ridges that is highly variable from case to case. This makes it difficult to predict the effect of an MJO, especially in regions far removed (e.g., North America) from the MJO's centers of action over the oceanic warm pool. The MJO signal is fairly small north of 30N on average. c) How do MJOs interact with slower climate processes like ENSO? Once SST anomalies associated with an ENSO are in place, the MJO life cycle is influenced by the SST anomalies. When or if an MJO develops, the simplest effect during El Nino is a farther eastward movement of the convection into the central Pacific whereas during La Nina the convection anomalies barely get into the western Pacific. In both cases the MJO still "starts" over the Indian Ocean. Despite this influence on the MJO life cycle, it is unclear whether overall MJO activity is influenced by the phase of the ENSO cycle. The natural variation of MJO activity is too large and observed datasets are too short to provide a definitive answer to this question. Transient convection at all time scales increases when sea surface temperatures (SST) reach ~ 29C (84F). On the other hand, there is a significant relationship between MJO activity and SST anomalies over the western Pacific Ocean (140-180E). When ENSO is in a neutral stage during the northern fall season and anomalously warm SST are present in the west Pacific Ocean, stronger MJO activity follows during the winter season. The 2003-04 northern winter was a good illustration of this relationship. d) How can the atmosphere and ocean signals associated with the MJO be determined? The MJO life cycle can be broken down into stages using an index based, for example, on the location of the MJO's tropical convection anomaly. The atmosphere's observed large-scale circulation and/or local weather anomalies can then be averaged over many cases to produce a "composite" `anomaly for each stage. Time filtering is usually applied to exclude higher and lower frequency variability. The results produce an estimate of the MJO signal or influence based on the observational record. The composite anomalies of circulation and weather are generally weak in the extratropics and moderately strong in the tropics and subtropics. They will be described in more detail later. e) How do MJOs interact with faster weather processes like synoptic scale waves and wavetrains? The composite anomalies, assuming they are statistically significant and large enough, produce persistent (1-3 week) changes in the atmospheric flow due to the MJO. These changes can influence the development and propagation of synoptic-scale weather systems, i.e. they influence the storm track. For example, during one stage Pacific Ocean storms tend to be stronger and farther south when they make landfall on the U.S. west coast. At the opposite stage the storm or wave energy may split and move south into the tropics and north into Canada, favoring storms over the central U.S. Plains. Because the MJO extratropical signal is weak there are large variations of the actual circulation or weather observed in individual cases. Other processes may overwhelm or mask the MJO signal. Daily monitoring of many individual cases has produced qualitative evidence for interaction between the circulation induced by flare-ups of convection within the MJO's convective envelope and synoptic scale waves or wavetrains passing by in mid-latitudes and the subtropics. These daily interactions are large amplitude and sometimes contribute to the rapid initiation of the composite MJO signal and/or major transitions in weather patterns.Until GCMs are able to simulate MJOs, we rely on daily monitoring and a subseasonal synoptic model to provide an early indication of such situations. f) How is the MJO signal extracted from climate forecasts? This section will discuss how the MJO signal is pulled from models and forecasts. Ideally, the MJO signal in the forecasts in the group will be displayed here. Advatanges and disadvantages of the different methods will be discussed. Modes of variability are extracted from the data which describe the MJO. Then, the forecasted time series of a variable like velocity potential is projected onto those modes and an amplitude and phase is extracted. Alvarez M. S., C. S. Vera, G. N. Kiladis and B. Liebmann (January 2016): Influence of the Madden Julian Oscillation on precipitation and surface air temperature in South America. Clim. Dyn., 46 (1), 245-262. doi:10.1007/s00382-015-2581-6. Carvalho, L., C Jones and B. Liebmann (2004), The South Atlantic convergence zone: Intensity, form, persistence, and relationships with intraseasonal to interannual activity and extreme rainfall, Journal of Climate, 17(1), 88-108, 10.1175/1520-0442%282004%29017%3C0088:TSACZI%3E2.0.CO;2.	.
Kiladis, G. N. and B. E. Mapes (2006), Convective life cycles and scale interactions in tropical waves, Dynamics of Atmospheres and Ocean, 42(1-4), 1-2, 10.1016/j.dynatmoce.2006.07.001.	.
Kiladis, G. N., K. Straub and P. Haertel (2005), Zonal and vertical structure of the Madden-Julian oscillation, Journal of the Atmospheric Sciences, 62(8), 2790-2809, 10.1175/JAS3520.1..
Kim, D., K. Sperber, W. Stern, D. Waliser, I. S. Kang, E. Maloney, W. Wang, K. M. Weickmann, J. Benedict, M. Khairoutdinov, M. I. Lee, R. Neale, M. Suarez, K. Thayer-Calder and G. Zhang (2009), Application of MJO Simulation Diagnostics to Climate Models, Journal of Climate, 22(23), 6413-6436, 10.1175/2009jcli3063.1..
Liebmann, B., G. N. Kiladis, C. Vera, A. Saulo and L. Carvalho (2004), Subseasonal variations of rainfall in South America in the vicinity of the low-level jet east of the Andes and comparison to those in the South Atlantic convergence zone, Journal of Climate, 17(19), 3829-3842, 10.1175/1520-0442%282004%29017%3C3829:SVORIS%3E2.0.CO;2.	.
Lin, J. L., G. N. Kiladis, B E Mapes, K. M. Weickmann, K R Sperber, W Lin, M C Wheeler, S D Schubert, A Del Genio, L J Donner, S Emori, J -F Gueremy, F Hourdin, P J Rasch, E Roeckner and J F Scinocca (2006), Tropical intraseasonal variability in 14 IPCC AR4 climate models. Part I: Convective signals, Journal of Climate, 19(12), 2665-2690, 10.1175/JCLI3735.1..
Lin, J. L., B. E. Mapes, M. Zhang and M. Newman (2004), Stratiform precipitation, vertical heating profiles, and the Madden-Julian oscillation, Journal of the Atmospheric Sciences, 61(3), 296-309, 10.1175/1520-0469%282004%29061%3C0296:SPVHPA%3E2.0.CO;2..
Lin, J. L., T. Shinoda, B. Liebmann, T. T. Qian, W. Q. Han, P. Roundy, J. Y. Zhou and Y. Zheng (2009), Intraseasonal Variability Associated with Summer Precipitation over South America Simulated by 14 IPCC AR4 Coupled GCMs, Monthly Weather Review, 137(9), 2931-2954, 10.1175/2009mwr2777.1..
Shinoda, T., P. E. Roundy and G. N. Kiladis (2008), Variability of intraseasonal Kelvin waves in the equatorial Pacific Ocean, Journal of Physical Oceanography, 38(5), 921-944, 10.1175/2007jpo3815.1.	.
Straub, K. H., G. N. Kiladis and P. E. Ciesielski (2006), The role of equatorial waves in the onset of the South China Sea summer monsoon and the demise of El Nino during 1998, Dynamics of Atmospheres and Ocean, 42(1-4, Sp. Iss. SI), 216-238, 10.1016/j.dynatmoce.2006.02.005.	.
Waliser, D., K. Sperber, H. Hendon, D. Kim, M. Wheeler, K. M. Weickmann, C. Zhang, L. Donner, J. Gottschalck, W. Higgins, I. S. Kang, D. Legler, M. Moncrieff, F. Vitart, B. Wang, W. Wang, S. Woolnough, E. Maloney, S. Schubert, W. Stern and O. Clivar Madden-Julian (2009), MJO Simulation Diagnostics, Journal of Climate, 22(11), 3006-3030, 10.1175/2008jcli2731.1.	.
Weickmann, K. M. and E. Berry (2009), The Tropical Madden-Julian Oscillation and the Global Wind Oscillation, Monthly Weather Review, 137(5), 1601-1614, 10.1175/2008mwr2686.1..
Weickmann, K. M. and E. Berry (2007), A synoptic-dynamic model of subseasonal atmospheric variability, Monthly Weather Review, 135(2), 449-474, 10.1175/mwr3293.1. Lin, J., B. Mapes, M. Zhang, and M. Newman, 2003: Stratiform precipitation, vertical heating profiles, and the Madden-Julian Oscillation. J. Atmos. Sci., in press. Aiyyer, A. R., & Molinari, J. (2003). Evolution of mixed rossby-gravity waves in idealized MJO environments. Journal of the Atmospheric Sciences, 60(23), 2837-2855. Aiyyer, A., & Molinari, J. (2002). Evolution of mixed rossby gravity waves in MJO type environments. 45 Beacon St. Boston MA 02108-3693 USA, [URL:http://www.ametsoc.org]: American Meteorological Society. Bannister, A. J., & Smith, K. J. (1993). The south pacific and southeast indian ocean tropical cyclone season 1990-91. Australian Meteorological Magazine, Canberra, Australia, 42(4), 175-182. Batstone, C., Matthews, A., & Stevens, D. (2002). Surface heat fluxes during the MJO and their effects on the oceanic mixed layer in the tropical eastern hemisphere. 45 Beacon St. Boston MA 02108-3693 USA, [URL:http://www.ametsoc.org]: American Meteorological Society. Bergman, J. W., Hendon, H. H., & Weickmann, K. M. (2001). Intraseasonal air-sea interactions at the onset of el nino. Journal of Climate, 14(8), 1702-1719. Bergman, J. W., Hendon, H. H., & Weickmann, K. M. (2001). Intraseasonal air-sea interactions at the onset of el nino. Journal of Climate, Boston, MA, 14(8), 1702-1719. Blade, I., & Hartmann, D. L. (1995). The linear and nonlinear extratropical response of the atmosphere to tropical intraseasonal heating. Journal of the Atmospheric Sciences, Boston, MA, 52(24), 4448-4471. Boer, G. J. (1995). Analyzed and forecast large-scale tropical divergent flow. Monthly Weather Review, Boston, MA, 123(12), 3539-3553. Bond, N. A., & Vecchi, G. A. (2003). The influence of the madden-julian oscillation on precipitation in oregon and washington. Weather and Forecasting, 18(4), 600-613. Bond, N., & Vecchi, G. (2003). The influence of the madden-julian oscillation (MJO) on the weather of alaska (2003 - 7POLARCLIM). 45 Beacon St. Boston MA 02108-3693 USA: American Meteorological Society. Retrieved July 12, 2004, from Meteorological & Geoastrophysical Abstracts database. Carvalho, L. M. V., Jones, C., & Liebmann, B. (2004). The south atlantic convergence zone: intensity, form, persistence, and relationships with intraseasonal to interannual activity and extreme rainfall. Journal of Climate, 17(1), 88-108. Castro Sr, C., & Cavalcanti, I. (2003). Intraseasonal modes of variability affecting the SACZ (2003 - 7ICSHMO). 45 Beacon St. Boston MA 02108-3693 USA: American Meteorological Society. Retrieved July 12, 2004, from Meteorological & Geoastrophysical Abstracts database. Chao, W. C., & Chen, B. (2001). The role of surface friction in tropical intraseasonal oscillation. Monthly Weather Review, 129(4), 896-904. Chao, W. C. (1995). A critique of wave-CISK as an explanation for the 40-50 day tropical intraseasonal oscillation. Journal of the Meteorological Society of Japan, Tokyo, Japan, 73(3), 677-684. Chao, W. C., & Chen, B. (2001). The role of surface friction in tropical intraseasonal oscillation. Monthly Weather Review, Boston, MA, 129(4), 896-904. Chen, B., & Yanai, M. (2000). Comparison of the madden-julian oscillation (MJO) during the TOGA COARE IOP with a 15-year climatology. Journal of Geophysical Research, Washington, DC, 105(D2), 2139-2149. Chen, B., & Yanai, M. (1999; 1999). 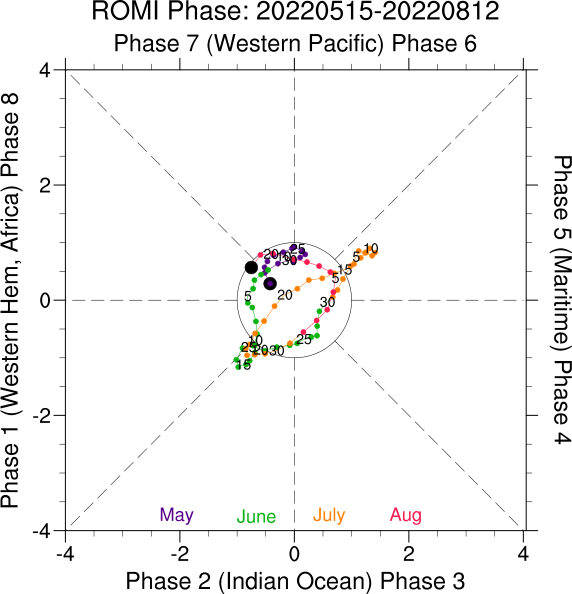 The madden-julian oscillation (MJO) observed during the TOGA-COARE intensive observing period. part III: A comparison with climatology. World Meteorological Organization, , 171-172. Chen, T., Yen, M., Pfaendtner, J., & Sud, Y. C. (1993). The vertical structure of diabatic heating associated with the madden-julian oscillation simulated by the goddard laboratory for atmospheres climate model. Journal of Geophysical Research, Washington, DC, 98(D5), 8801-8813. Clayson, C. A., Strahl, B., & Schrage, J. (2002). 2-3-day convective variability in the tropical western pacific. Monthly Weather Review, 130(3), 529-548. Colon, E., Lindesay, J., & Suarez, M. J. (2002). The impact of surface flux- and circulation-driven feedbacks on simulated madden-julian oscillations. Journal of Climate, 15(6), 624-641. Compo, G. P., Kiladis, G. N., & Webster, P. J. (1999; 1999). The relationship between east asian pressure surges and the madden-julian oscillation. World Meteorological Organization, , 173-174. Davidson, N., Adug, E., Hassan, W., Nguyen, P., & Prabowo, M. (2002). Diagnosis and prediction of some extreme rain events over southeast asia. 45 Beacon St. Boston MA 02108-3693 USA, [URL:http://www.ametsoc.org]: American Meteorological Society. De Lima Moscati, M. C., & Rao, V. B. (2001). Energetics of the summer circulation over south america. Annales Geophysicae, 19(1), 83-97. Dickinson, M., & Molinari, J. (2002). Mixed rossby-gravity waves and western pacific tropical cyclogenesis. part I: synoptic evolution. Journal of the Atmospheric Sciences, 59(14), 2183-2196. Donald, A., Ribbe, J., Stone, R., Wheeler, M., Meinke, H., & Harris, G. et al. (2003). Using the real-time multivariate madden julian oscillation indices to predict rainfall in queensland (2003 - 7ICSHMO). 45 Beacon St. Boston MA 02108-3693 USA: American Meteorological Society. Retrieved July 12, 2004, from Meteorological & Geoastrophysical Abstracts database. Fasullo, J., & Webster, P. J. (2000). Atmospheric and surface variations during westerly wind bursts in the tropical western pacific. Quarterly Journal of the Royal Meteorological Society, Berkshire, England, 126(564), 899-924. Feldstein, S. B. (1999). The atmospheric dynamics of intraseasonal length-of-day fluctuations during the austral winter. Journal of the Atmospheric Sciences, Boston, MA, 56(17), 3043-3058. Ferreira, R. N., Schubert, W. H., & Hack, J. J. (1996). Dynamical aspects of twin tropical cyclones associated with the madden-julian oscillation. Journal of the Atmospheric Sciences, Boston, MA, 53(7), 929-945. Fink, A. (1995; 1995). The physical causes for the variability of intraseasonal tropical convection fluctuations over the indo-pacific. Universitaet zu Koeln, , 118. Fink, A., & Speth, P. (1997). Some potential forcing mechanisms of the year-to-year variability of the tropical convection and its intraseasonal (25-70-day) variability. International Journal of Climatology, Chichester, UK, 17(14), 1513-1534. Flatau, M., & Flatau, P. (1999; 1999). Atmosphere ocean interactions in the equatorial perturbations. World Meteorological Organization, , 189-190. Flatau, M., Flatau, P., Rudnick, D., & Niiler, P. P. (1999; 1999). Intraseasonal oscillations and asian monsoon onset. World Meteorological Organization, , 163-164. Frederiksen, J. S. (2002). Genesis of intraseasonal oscillations and equatorial waves. Journal of the Atmospheric Sciences, 59(19), 2761-2781. Fujiwara, M., Kita, K., & Ogawa, T. (1998). Stratosphere-troposphere exchange of ozone associated with the equatorial kelvin wave as observed with ozonesondes and rawinsondes. Journal of Geophysical Research, Washington, DC, 103(D15), 19173-19182. Grabowski, W. W. (2003). MJO-like coherent structures: sensitivity simulations using the cloud-resolving convection parameterization (CRCP). Journal of the Atmospheric Sciences, 60(6), 847-864. Grabowski, W. (2002). Cloud microphysics and the tropical climate: idealized aquaplanet simulations using the cloud-resolving convection parameterization (CRCP) (2002 - 11cldphy). 45 Beacon St. Boston MA 02108-3693 USA: American Meteorological Society. Retrieved July 12, 2004, from Meteorological & Geoastrophysical Abstracts database. Grabowski, W. (2002). MJO-like coherent structures in idealized aquaplanet simulations. 45 Beacon St. Boston MA 02108-3693 USA, [URL:http://www.ametsoc.org]: American Meteorological Society. Grabowski, W., & Moncrieff, M. (2002). Large-scale organization of tropical convection in idealized numerical simulations: impact of radiative processes (2002 - 11atrad). 45 Beacon St. Boston MA 02108-3693 USA: American Meteorological Society. Retrieved July 12, 2004, from Meteorological & Geoastrophysical Abstracts database. Gualdi, S., Navarra, A., & Tinarelli, G. (1999). The interannual variability of the madden-julian oscillation in an ensemble of GCM simulations. Climate Dynamics, Berlin, Germany, 15(9), 643-658. Gualdi, S., Navarra, A., & von Storch, H. (1997). Tropical intraseasonal oscillation appearing in operational analyses and in a family of general circulation models. Journal of the Atmospheric Sciences, Boston, MA, 54(9), 1185-1202. Gualdi, S., von Storch, H., & Navarra, A. (1995; 1995). Tropical intraseasonal oscillation appearing in operational analyses and in a family of general circulation models. Max-Planck-Institut fuer Meteorologie, , 38. Hall, J. D., Matthews, A. J., & Karoly, D. J. (2001). The modulation of tropical cyclone activity in the australian region by the madden-julian oscillation. Monthly Weather Review, 129(12), 2970-2982. Hall-McKim, E., Nolin, A., Lo, F., Serreze, M., & Clark, M. (2002). Frequency analysis of intraseasonal variations in the north american monsoon system. 45 Beacon St. Boston MA 02108-3693 USA: American Meteorological Society. Retrieved July 12, 2004, from Meteorological & Geoastrophysical Abstracts database. Han, W., Lawrence, D. M., & Webster, P. J. (2001). Dynamical response of equatorial indian ocean to intraseasonal winds: zonal flow. Geophysical Research Letters, 28(22), 4215-4218. Harris, K. A. (1999; 1999). Teleconnection patterns associated with the MJO: a shallow water model analysis. World Meteorological Organization, , 409-410. Hartmann, D. L., & Maloney, E. D. (2001). The madden-julian oscillation, barotropic dynamics, and north pacific tropical cyclone formation. part II: stochastic barotropic modeling. Journal of the Atmospheric Sciences, 58(17), 2559-2570. Hartmann, D. L., Michelsen, M. L., & Klein, S. A. (1992). Seasonal variations of tropical intraseasonal oscillations: a 20-25-day oscillation in the western pacific. Journal of the Atmospheric Sciences, Boston, MA, 49(14), 1277-1289. Hendon, H. H. (2000). Impact of air-sea coupling on the madden-julian oscillation in a general circulation model. Journal of the Atmospheric Sciences, Boston, MA, 57(24), 3939-3952. Hendon, H. H. (1995). Length of day changes associated with the madden-julian oscillation. Journal of the Atmospheric Sciences, Boston, MA, 52(13), 2373-2383. Hendon, H. H., & Glick, J. (1997). Intraseasonal air-sea interaction in the tropical indian and pacific oceans. Journal of Climate, Boston, MA, 10(4), 647-661. Hendon, H. H., & Liebmann, B. (1994). Organization of convection within the madden-julian oscillation. Journal of Geophysical Research, Washington, DC, 99(D4), 8073-8083. Hendon, H. H., Liebmann, B., & Glick, J. D. (1998). Oceanic kelvin waves and the madden-julian oscillation. Journal of the Atmospheric Sciences, Boston, MA, 55(1), 88-101. Hendon, H. H., Liebmann, B., Newman, M., Glick, J. D., & Schemm, J. E. (2000). Medium-range forecast errors associated with active episodes of the madden-julian oscillation. Monthly Weather Review, Boston, MA, 128(1), 69-86. Hendon, H. H., & Salby, M. L. (1996). Planetary-scale circulations forced by intraseasonal variations of observed convection. Journal of the Atmospheric Sciences, Boston, MA, 53(12), 1751-1758. Hendon, H. H., & Salby, M. L. (1994). The life cycle of the madden-julian oscillation. Journal of the Atmospheric Sciences, Boston, MA, 51(15), 2225-2237. Hendon, H. H., Zhang, C., & Glick, J. D. (1999). Interannual variation of the madden-julian oscillation during austral summer. Journal of Climate, Boston, MA, 12(8), 2538-2550. Higgins, R. W., & Shi, W. (2001). Intercomparison of the principal modes of interannual and intraseasonal variability of the north american monsoon system. Journal of Climate, 14(3), 403-417. Higgins, R. W., & Shi, W. (2001). Intercomparison of the principal modes of interannual and intraseasonal variability of the north american monsoon system. Journal of Climate, Boston, MA, 14(3), 403-417. Hung, C. -., & Yanai, M. (2002). Factors contributing to the onset of the australian summer monsoon. 45 Beacon St. Boston MA 02108-3693 USA, [URL:http://www.ametsoc.org]: American Meteorological Society. Johnson, R. H., Ciesielski, P. E., & Cotturone, J. A. (2001). Multiscale variability of the atmospheric mixed layer over the western pacific warm pool. Journal of the Atmospheric Sciences, 58(18), 2729-2750. 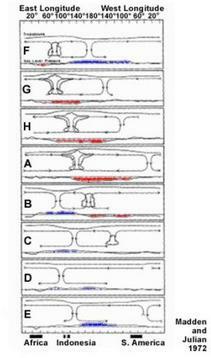 Jones, C., Carvalho, L. M. V., Wayne Higgins, R., Waliser, D. E., & Schemm, J. E. (2004). Climatology of tropical intraseasonal convective anomalies: 1979-2002. Journal of Climate, 17(3), 523-539. Jones, C., Carvalho, L., Higgins, W., Waliser, D., & Schemm, J. -. (2003). Variability of tropical intraseasonal convective anomalies (2003 - 14GLOBAL). 45 Beacon St. Boston MA 02108-3693 USA: American Meteorological Society. Retrieved July 12, 2004, from Meteorological & Geoastrophysical Abstracts database. Jones, C., Waliser, D. E., Schemm, J. -. E., & Lau, W. K. M. (2000). Prediction skill of the madden and julian oscillation in dynamical extended range forecasts. Climate Dynamics, Berlin, Germany, 16(4), 273-289. Jones, C. (2000). Occurrence of extreme precipitation events in california and relationships with the madden-julian oscillation. Journal of Climate, Boston, MA, 13(20), 3576-3587. Jones, C., & Schemm, J. E. (2000). The influence of intraseasonal variations on medium- to extended-range weather forecasts over south america. Monthly Weather Review, Boston, MA, 128(2), 486-494. Jones, C., Waliser, D. E., & Gautier, C. (1998). The influence of the madden-julian oscillation on ocean surface heat fluxes and sea surface temperature. Journal of Climate, Boston, MA, 11(5), 1057-1072. Jones, C., & Weare, B. C. (1996). The role of low-level moisture convergence and ocean latent heat fluxes in the madden and julian oscillation: an observational analysis using ISCCP data and ECMWF analyses. Journal of Climate, Boston, MA, 9(12), 3086-3104. Kane, R. P. (2000). ENSO relationship with indian rainfall in different months. International Journal of Climatology, Chichester, UK, 20(7), 783-792. Kayano, M. T., & Kousky, V. E. (1999). Intraseasonal (30-60 day) variability in the global tropics: principal modes and their evolution. Tellus.Series A-B, Stockholm, Sweden, 51A(3), 373-386. Kemball-Cook, S. R., & Weare, B. C. (2001). The onset of convection in the madden-julian oscillation. Journal of Climate, Boston, MA, 14(5), 780-793. Kessler, W. S. (2001). 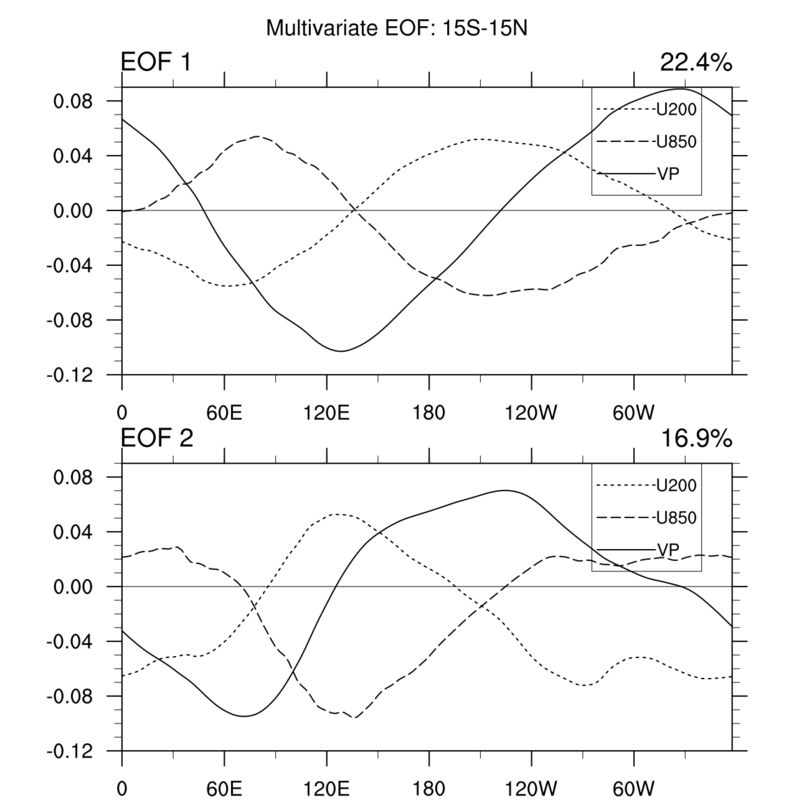 EOF representations of the madden-julian oscillation and its connection with ENSO. Journal of Climate, 14(13), 3055-3061. Kessler, W. S., & Kleeman, R. (2000). Rectification of the madden-julian oscillation into the ENSO cycle. Journal of Climate, Boston, MA, 13(20), 3560-3575. Kessler, W. S., McPhaden, M. J., & Weickmann, K. M. (1995). Forcing of intraseasonal kelvin waves in the equatorial pacific. Journal of Geophysical Research, Washington, DC, 100(C6), 10613-10631. Kikuchi, K., & Takayabu, Y. N. (2003). Equatorial circumnavigation of moisture signal associated with the madden- julian oscillation (MJO) during boreal winter. Journal of the Meteorological Society of Japan, 81(4), 851-869. Kiladis, G. (2003). Ocean-atmosphere interaction within equatorially trapped atmospheric waves (2003 - 12ISA). 45 Beacon St. Boston MA 02108-3693 USA: American Meteorological Society. Retrieved July 12, 2004, from Meteorological & Geoastrophysical Abstracts database. Kiladis, G., & Revell, M. (2003). Modulation of southern hemisphere storm track activity by the madden-julian oscillation (2003 - 7ICSHMO). 45 Beacon St. Boston MA 02108-3693 USA: American Meteorological Society. Retrieved July 12, 2004, from Meteorological & Geoastrophysical Abstracts database. Kiladis, G., & Straub, K. (2003). Ocean-atmosphere interaction within equatorially trapped atmospheric waves (2003 - 12ISA). 45 Beacon St. Boston MA 02108-3693 USA: American Meteorological Society. Retrieved July 12, 2004, from Meteorological & Geoastrophysical Abstracts database. Krishnamurti, T. N., Chakraborty, D. R., Cubukcu, N., Stefanova, L., & Vijayakumar, T. S. V. (2003). A mechanism of the madden-julian oscillation based on interactions in the frequency domain. Quarterly Journal of the Royal Meteorological Society, 129(593B), 2559-2590. Krishnan, R., & Venkatesan, C. (1997). Mechanisms of low frequency intraseasonal oscillations of the indian summer monsoon. Meteorology and Atmospheric Physics, Vienna, Austria, 62(1-2), 101-128. Lambert, S. J. (1990). Observed and simulated intraseasonal energetics. Journal of Climate, Boston, MA, 3(12 </STRONG> </PRE> </BODY> </HTML>), 1330-1346. Retrieved July 12, 2004, from Meteorological & Geoastrophysical Abstracts database. Lau, K. -., Li, X., & Wu, H. T. (2002). Evolution of the large scale circulation, cloud structure and regional water cycle associated with the south china sea monsoon during may-june, 1998. Journal of the Meteorological Society of Japan, 80(5), 1129-1147. Lau, K. -., Sheu, P. -., & Kang, I. -. (1994). Multiscale low-frequency circulation modes in the global atmosphere. Journal of the Atmospheric Sciences, Boston, MA, 51(9), 1169-1193. Lau, K. -., Sheu, P. J., Schubert, S., Ledvina, D., & Weng, H. (1996). 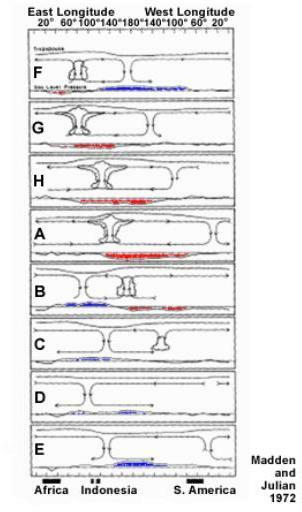 Evolution of large-scale circulation during TOGA COARE: model intercomparison and basic features. Journal of Climate, Boston, MA, 9(5), 986-1003. Lau, K. -., & Sui, C. -. (1997). Mechanisms of short-term sea surface temperature regulation: observations during TOGA COARE. Journal of Climate, Boston, MA, 10(3), 465-472. Lau, K. -., & Wu, H. -. (1994). Large scale dynamics associated with super cloud cluster organization over the tropical western pacific. Journal of the Meteorological Society of Japan, Tokyo, Japan, 72(4), 481-497. Lee, S. (1999). Why are the climatological zonal winds easterly in the equatorial upper troposphere? Journal of the Atmospheric Sciences, Boston, MA, 56(10), 1353-1363. Li, W., Yu, R., & Zhang, X. (2001). Impacts of sea surface temperature in the tropical pacific on interannual variability of madden-julian oscillation in precipitation. Advances in Atmospheric Sciences, Beijing, China, 18(3), 429-444. Liebmann, B., Hendon, H. H., & Glick, J. D. (1994). The relationship between tropical cyclones of the western pacific and indian oceans and the madden-julian oscillation. Journal of the Meteorological Society of Japan, Tokyo, Japan, 72(3), 401-412. Liess, S., Bengtsson, L., & Arpe, K. (2001). The madden-julian oscillation in the ECHAM4/OPYC3 CGCM (M2 551.581.1 Theoretical climatology. Climatic models. Solar climate (551.581.1); M2 551.465.7:551.5 No. 319) July 12, 2004, from Meteorological & Geoastrophysical Abstracts database. Lin, J. W., Neelin, J. D., & Zeng, N. (2000). Maintenance of tropical intraseasonal variability: impact of evaporation-wind feedback and midlatitude storms. Journal of the Atmospheric Sciences, Boston, MA, 57(17), 2793-2823. Lin, J. W., Neelin, J. D., & Zeng, N. (1999; 1999). Maintenance of tropical intraseasonal variability in an intermediate-complexity atmospheric model. World Meteorological Organization, , 179-180. Lo, F., & Hendon, H. H. (2000). Empirical extended-range prediction of the madden-julian oscillation. Monthly Weather Review, Boston, MA, 128(7), 2528-2543. Maloney, E. D. (2002). An intraseasonal oscillation composite life cycle in the NCAR CCM3.6 with modified convection. Journal of Climate, 15(9), 964-982. Maloney, E. D., & Esbensen, S. K. (2003). The amplification of east pacific madden-julian oscillation convection and wind anomalies during june-november. Journal of Climate, 16(21), 3482-3497. Maloney, E. D., & Hartmann, D. L. (2001). The madden-julian oscillation, barotropic dynamics, and north pacific tropical cyclone formation. part I: observations. Journal of the Atmospheric Sciences, 58(17), 2545-2558. Maloney, E. D., & Kiehl, J. T. (2002). Intraseasonal eastern pacific precipitation and SST variations in a GCM coupled to a slab ocean model. Journal of Climate, 15(21), 2989-3007. Maloney, E. D., & Kiehl, J. T. (2002). MJO-related SST variations over the tropical eastern pacific during northern hemisphere summer. Journal of Climate, 15(6), 675-689. Maloney, E. D., & Hartmann, D. L. (2000). Modulation of eastern north pacific hurricanes by the madden-julian oscillation. Journal of Climate, Boston, MA, 13(9), 1451-1460. Maloney, E. D., & Hartmann, D. L. (2000). Modulation of hurricane activity in the gulf of mexico by the madden-julian oscillation. Science, Washington, DC, 287(5460), 2002-2004. Maloney, E. D., & Hartmann, D. L. (1998). Frictional moisture convergence in a composite life cycle of the madden-julian oscillation. Journal of Climate, Boston, MA, 11(9), 2387-2403. Marcus, S. L., Dickey, J. O., & De Viron, O. (2001). Links between intraseasonal (extended MJO) and ENSO timescales: insights via geodetic and atmospheric analysis. Geophysical Research Letters, 28(18), 3465-3468. Marcus, S. L., Ghil, M., & Dickey, J. O. (1994). The extratropical 40-day oscillation in the UCLA general circulation model. part I: atmospheric angular momentum. Journal of the Atmospheric Sciences, Boston, MA, 51(11), 1431-1446. Marshall, A., Alves, O., Hendon, H., & Karoly, D. (2003). Investigating the role of air-sea coupling on the madden julian oscillation (2003 - 7ICSHMO). 45 Beacon St. Boston MA 02108-3693 USA: American Meteorological Society. Retrieved July 12, 2004, from Meteorological & Geoastrophysical Abstracts database. Matthews, A. J. (2000). Propagation mechanisms for the madden-julian oscillation. Quarterly Journal of the Royal Meteorological Society, Berkshire, England, 126(569), 2637-2651. Matthews, A. J., Hoskins, B. J., Slingo, J. M., & Blackburn, M. (1996). Development of convection along the SPCZ within a madden-julian oscillation. Quarterly Journal of the Royal Meteorological Society, Berkshire, England, 122(531), 669-688. Matthews, A. J., & Kiladis, G. N. (1999). The tropical-extratropical interaction between high-frequency transients and the madden-julian oscillation. Monthly Weather Review, Boston, MA, 127(5), 661-677. Matthews, A. J., & Lander, J. (1999). Physical and numerical contributions to the structure of kelvin wave-CISK modes in a spectral transform model. Journal of the Atmospheric Sciences, Boston, MA, 56(23), 4050-4058. Matthews, A. J., Slingo, J. M., Hoskins, B. J., & Inness, P. M. (1999). Fast and slow kelvin waves in the madden-julian oscillation of a GCM. Quarterly Journal of the Royal Meteorological Society, Berkshire, England, 125(557), 1473-1498. Meehl, G. A., Kiladis, G. N., Weickmann, K. M., Wheeler, M., Gutzler, D. S., & Compo, G. P. (1996). Modulation of equatorial subseasonal convective episodes by tropical-extratropical interaction in the indian and pacific ocean regions. Journal of Geophysical Research, Washington, DC, 101(D10), 15033-15049. Meehl, G. A., Wheeler, M., & Washington, W. M. (1994). Low-frequency variability and CO sub(2) transient climate change. part 3: intermonthly and interannual variability. Climate Dynamics, Berlin, Germany, 10(6-7), 277-303. Miller, A. J., Zhou, S., & Yang, S. (2003). Relationship of the arctic and antarctic oscillations to the outgoing longwave radiation. Journal of Climate, 16(10), 1583-1592. Mo, K. C. (2000). 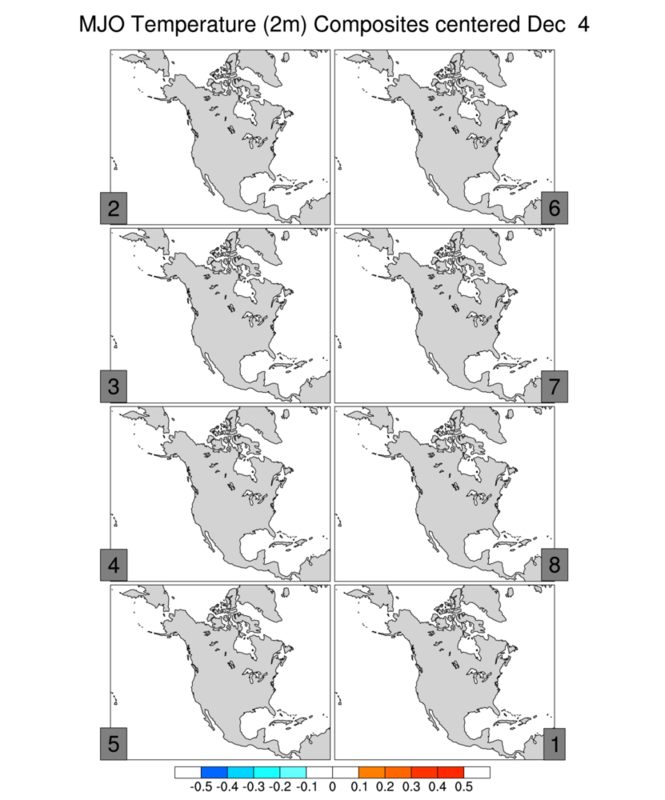 Intraseasonal modulation of summer precipitation over north america. Monthly Weather Review, Boston, MA, 128(5), 1490-1505. Mo, K. C. (1999). Alternating wet and dry episodes over california and intraseasonal oscillations. Monthly Weather Review, Boston, MA, 127(12), 2759-2776. Molinari, J., Knight, D., Dickinson, M., Vollaro, D., & Skubis, S. (1997). Potential vorticity, easterly waves, and eastern pacific tropical cyclogenesis. Monthly Weather Review, Boston, MA, 125(10), 2699-2708. Molinari, J., & Vollaro, D. (2000). Planetary- and synoptic-scale influences on eastern pacific tropical cyclogenesis. Monthly Weather Review, Boston, MA, 128(9), 3296-3307. Moore, A. M., & Kleeman, R. (1999; 1999). Stochastic forcing of ENSO intraseasonal variability: implications for ENSO prediction and predictability. World Meteorological Organization, , 383-384. Moskowitz, B. M., & Bretherton, C. S. (2000). An analysis of frictional feedback on a moist equatorial kelvin mode. Journal of the Atmospheric Sciences, Boston, MA, 57(13), 2188-2206. Myers, D. S., & Waliser, D. E. (2003). Three-dimensional water vapor and cloud variations associated with the madden-julian oscillation during northern hemisphere winter. Journal of Climate, 16(6), 929-950. Myers, D., & Waliser, D. (2003). Analysis of moisture variability associated with the madden julian oscillation during northern hemisphere winter (2003 - VARIH2O). 45 Beacon St. Boston MA 02108-3693 USA: American Meteorological Society. Retrieved July 12, 2004, from Meteorological & Geoastrophysical Abstracts database. Nakazawa, T. (2000). MJO and tropical cyclone activity during 1997/98 ENSO. Advances in Space Research, Oxford, England, 25(5), 953-958. Nakazawa, T. (1999; 1999). MJOAa key component in the atmosphere for triggering ENSO. World Meteorological Organization, , 165-166. Oouchi, K., & Yamasaki, M. (2001). An MJO-like gravity wave and superclusters simulated in a two-dimensional cumulus-scale-resolving model under a warm pool condition. Journal of the Meteorological Society of Japan, 79(1), 201-218. Park, C., Suarez, M. J., & Schubert, S. D. (1995). Response of the zonally asymmetric flow to time-dependent tropical heating. Journal of the Atmospheric Sciences, Boston, MA, 52(21), 3738-3756. Potemra, J. T., Hautala, S. L., Sprintall, J., & Pandoe, W. (2002). Interaction between the indonesian seas and the indian ocean in observations and numerical models. Journal of Physical Oceanography, 32(6), 1838-1854. Rajendran, K., Nanjundiah, R. S., & Srinivasan, J. (2002). The impact of surface hydrology on the simulation of tropical intraseasonal oscillation in NCAR (CCM2) atmospheric GCM. Journal of the Meteorological Society of Japan, 80(6), 1357-1381. Raymond, D. J. (2001). A new model of the madden-julian oscillation. Journal of the Atmospheric Sciences, 58(18), 2807-2819. Ren, B., & Huang, R. (2003). 30-60-day oscillations of convection and circulation associated with the thermal state of the western pacific warm pool during boreal summer. Advances in Atmospheric Sciences, 20(5), 781-793. Revell, M., & Renwick, J. (2003). Why was september 2001 to september 2002 a year of anomalously low pressures over the tasman sea? (2003 - 7ICSHMO). 45 Beacon St. Boston MA 02108-3693 USA: American Meteorological Society. Retrieved July 12, 2004, from Meteorological & Geoastrophysical Abstracts database. Reynolds, C., Gelaro, R., & Murphree, T. (1996). Observed and simulated northern hemisphere intraseasonal circulation anomalies and the influence of model bias. Monthly Weather Review, Boston, MA, 124(6), 1100-1118. Salby, M. L., Garcia, R. R., & Hendon, H. H. (1994). Planetary-scale circulations in the presence of climatological and wave-induced heating. Journal of the Atmospheric Sciences, Boston, MA, 51(16), 2344-2367. Salby, M. L., & Hendon, H. H. (1994). Intraseasonal behavior of clouds, temperature, and motion in the tropics. Journal of the Atmospheric Sciences, Boston, MA, 51(15), 2207-2224. Schmidt, F. (2000). On normal mode aided modelling: application to asian monsoon. Meteorology and Atmospheric Physics, Vienna, Austria, 73(3-4), 189-210. Schrage, J. M., Vincent, D. G., & Fink, A. H. (1999). Modulation of intraseasonal (25-70 day) processes by the superimposed ENSO cycle across the pacific basin. Meteorology and Atmospheric Physics, Vienna, Austria, 70(1-2), 15-27. Schubert, S. D., & Wu, M. L. (2001). Predictability of the 1997 and 1998 south asian summer monsoon low-level winds. Journal of Climate, 14(15), 3173-3191. Sheaffer, J. (2002). Variability of MJO associated with ENSO and the QBO. 45 Beacon St. Boston MA 02108-3693 USA, [URL:http://www.ametsoc.org]: American Meteorological Society. Sheng, J. (1995). The madden-julian oscillation in the canadian climate centre general circulation model. Climate Dynamics, Berlin, Germany, 12(2), 125-140. Shinoda, T., & Hendon, H. H. (2002). Rectified wind forcing and latent heat flux produced by the madden-julian oscillation. Journal of Climate, 15(23), 3500-3508. Shinoda, T., & Hendon, H. H. (2001). Upper-ocean heat budget in response to the madden-julian oscillation in the western equatorial pacific. Journal of Climate, 14(21), 4147-4165. Shinoda, T., & Hendon, H. (1999; 1999). Modeling of intraseasonal variability in the tropical western pacific and indian oceans. World Meteorological Organization, , 187-188. Shinoda, T., Hendon, H. H., & Glick, J. (1998). Intraseasonal variability of surface fluxes and sea surface temperature in the tropical western pacific and indian oceans. Journal of Climate, Boston, MA, 11(7), 1685-1702. Slingo, J. M., Rowell, D. P., Sperber, K. R., & Nortley, F. (1999; 1999). On the predictability of the interannual behaviour of the madden-julian oscillation and its relationship to el nino. World Meteorological Organization, , 335-336. Slingo, J. M., Rowell, D. P., Sperber, K. R., & Nortley, F. (1999). On the predictability of the interannual behaviour of the madden-julian oscillation and its relationship with el nino. Quarterly Journal of the Royal Meteorological Society, Berkshire, England, 125(554), 583-609. Slingo, J. (1998). The 1997/98 el nino. Weather, Bracknell, England, 53(9), 274-281. Sobel, A. H., & Maloney, E. D. (2000). 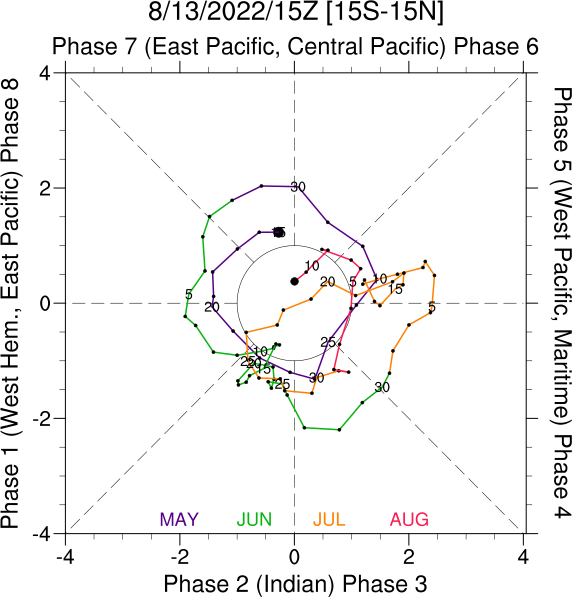 Effect of ENSO and the MJO on western north pacific tropical cyclones. Geophysical Research Letters, Washington, DC, 27(12), 1739-1742. Stephens, D., & Lamond, M. (2003). ENSO: the equator and the southern mid-latitudes must work together (2003 - 7ICSHMO). 45 Beacon St. Boston MA 02108-3693 USA: American Meteorological Society. Retrieved July 12, 2004, from Meteorological & Geoastrophysical Abstracts database. Teng, H., & Wang, B. (2003). Interannual variations of the boreal summer intraseasonal oscillation in the asian-pacific region. Journal of Climate, 16(22), 3572-3584. Tompkins, A., & Jung, T. (2002). Investigation of the MJO in the ECMWF model. 45 Beacon St. Boston MA 02108-3693 USA, [URL:http://www.ametsoc.org]: American Meteorological Society. Tung, W., & Yanai, M. (2002). Convective momentum transport observed during the TOGA COARE IOP. part 2. case studies. Journal of the Atmospheric Sciences, 59(17), 2535-2549. Tung, W., & Yanai, M. (2002). Convective momentum transport observed during the TOGA COARE IOP. part I: general features. Journal of the Atmospheric Sciences, 59(11), 1857-1871. Tung, W. -., & Yanai, M. (2002). Convective momentum transport observed during the TOGA COARE IOP: implications for parameterization. 45 Beacon St. Boston MA 02108-3693 USA, [URL:http://www.ametsoc.org]: American Meteorological Society. Tung, W. (1999; 1999). The madden-julian oscillation (MJO) observed during the TOGA-COARE intensive observing period. part II: convection associated with MJO. World Meteorological Organization, , 169-170. Vecchi, G. A., & Harrison, D. E. (1999; 1999). Large scale environmental associations with equatorial westerly wind events. World Meteorological Organization, , 387-388. Vincent, D. G., Fink, A., Schrage, J. M., & Speth, P. (1998). High- and low-frequency intraseasonal variance of OLR on annual and ENSO timescales. Journal of Climate, Boston, MA, 11(5), 968-986. Waliser, D. E., Lau, K. M., Stern, W., & Jones, C. (2003). Potential predictability of the madden-julian oscillation. Bulletin of the American Meteorological Society, 84(1), 33-50. Waliser, D. (2002). Potential predictability of the madden-julian oscillation. 45 Beacon St. Boston MA 02108-3693 USA: American Meteorological Society. Retrieved July 12, 2004, from Meteorological & Geoastrophysical Abstracts database. Waliser, D. (2002). Potential predictability of the madden-julian oscillation (2002 - observations). 45 Beacon St. Boston MA 02108-3693 USA: American Meteorological Society. Retrieved July 12, 2004, from Meteorological & Geoastrophysical Abstracts database. Waliser, D. E. (1996). Formation and limiting mechanisms for very high sea surface temperature: linking the dynamics and the thermodynamics. Journal of Climate, Boston, MA, 9(1), 161-188. Waliser, D. E., Jones, C., Schemm, J. E., & Graham, N. E. (1999; 1999). Extended-range tropical forecasts based on the slow evolution of the madden-julian oscillation. World Meteorological Organization, , 337-338. Waliser, D. E., Jones, C., Schemm, J. E., & Graham, N. E. (1999). A statistical extended-range tropical forecast model based on the slow evolution of the madden-julian oscillation. Journal of Climate, Boston, MA, 12(7), 1918-1939. Waliser, D. E., Lau, K. M., & Kim, J. (1999; 1999). The influence of coupled sea surface temperatures on the madden-julian oscillation: a model perturbation experiment. World Meteorological Organization, , 181-182. Waliser, D. E., Lau, K. M., & Kim, J. (1999). The influence of coupled sea surface temperatures on the madden-julian oscillation: a model perturbation experiment. Journal of the Atmospheric Sciences, Boston, MA, 56(3), 333-358. Wang, B., & Xie, X. (1999; 1999). Impacts of the ocean-atmosphere interaction over the warm pool on MJO. World Meteorological Organization, , 177-178. Wang, B., & Xie, X. (1998). Coupled modes of the warm pool climate system. part I: the role of air-sea interaction in maintaining madden-julian oscillation. Journal of Climate, Boston, MA, 11(8), 2116-2135. Wang, W., Saha, S., & Kistler, R. (2003). MJO forecast with the NCEP MRF model: necessity of the inclusion of an interactive ocean (2003 - 12ISA). 45 Beacon St. Boston MA 02108-3693 USA: American Meteorological Society. Retrieved July 12, 2004, from Meteorological & Geoastrophysical Abstracts database. Watterson, I. G. (2002). The sensitivity of subannual and intraseasonal tropical variability to model ocean mixed layer depth. Journal of Geophysical Research.D.Atmospheres, 107(D1-D2), [na]. Weare, B. C. (2003). Composite singular value decomposition analysis of moisture variations associated with the madden-julian oscillation. Journal of Climate, 16(22), 3779-3792. Weare, B. (2003). Moisture variations associated with the initiation of madden-julian oscillation (2003 - 14GLOBAL). 45 Beacon St. Boston MA 02108-3693 USA: American Meteorological Society. Retrieved July 12, 2004, from Meteorological & Geoastrophysical Abstracts database. Weare, B. (2003). Moisture variations associated with the initiation of madden-julian oscillation (2003 - 14GLOBAL). 45 Beacon St. Boston MA 02108-3693 USA; Aerosols, and Clouds: American Meteorological Society. Retrieved July 12, 2004, from Meteorological & Geoastrophysical Abstracts database. Weickmann, K. M. (1991). El Nino/Southern oscillation and madden-julian (30-60 day) oscillations during 1981-1982. Journal of Geophysical Research, Washington, DC, 96, 3187-3195. Wheeler, M., & Weickmann, K. M. (2001). Real-time monitoring and prediction of modes of coherent synoptic to intraseasonal tropical variability. Monthly Weather Review, 129(11), 2677-2694. Wheeler, M. (2003). The madden-julian oscillation and the java floods of January/February 2002 (2003 - 7ICSHMO). 45 Beacon St. Boston MA 02108-3693 USA: American Meteorological Society. Retrieved July 12, 2004, from Meteorological & Geoastrophysical Abstracts database. Woolnough, S., Slingo, J., & Hoskins, B. (1999; 1999). The relationship between convection and surface fluxes on intraseasonal timescales. World Meteorological Organization, , 183-184. Wu, M. L. C., Schubert, S., Kang, I., & Waliser, D. (2002). Forced and free intraseasonal variability over the south asian monsoon region simulated by 10 AGCMs. Journal of Climate, 15(20), 2862-2880. Yanai, M., & Chen, B. (1999; 1999). The madden-julian oscillation (MJO) observed during the TOGA-COARE intensive observing period. part I: global view. World Meteorological Organization, , 167-168. Yanai, M., Chen, B., & Tung, W. (2000). The madden-julian oscillation observed during the TOGA COARE IOP: global view. Journal of the Atmospheric Sciences, Boston, MA, 57(15), 2374-2396. Zavala-Garay, J., Moore, A. M., Perez, C. L., & Kleeman, R. (2003). The response of a coupled model of ENSO to observed estimates of stochastic forcing. Journal of Climate, 16(17), 2827-2842. Zhang, C. (2001). Intraseasonal perturbations in sea surface temperatures of the equatorial eastern pacific and their association with the madden-julian oscillation. Journal of Climate, 14(6), 1309-1322. Zhang, C., & Anderson, S. P. (2003). Sensitivity of intraseasonal perturbations in SST to the structure of the MJO. Journal of the Atmospheric Sciences, 60(17), 2196-2207. Zhang, C., & Gottschalck, J. (2002). SST anomalies of ENSO and the madden-julian oscillation in the equatorial pacific. Journal of Climate, 15(17), 2429-2445. Zhang, C. (2001). Intraseasonal perturbations in sea surface temperatures of the equatorial eastern pacific and their association with the madden-julian oscillation. Journal of Climate, Boston, MA, 14(6), 1309-1322. Zhang, C. (1999; 1999). Intraseasonal atmospheric surface forcing, oceanic responses, and SST feedback in the equatorial western pacific. World Meteorological Organization, , 175-176. Zhang, C. (1999; 1999). Variability of tropospheric water vapor and its effects on deep convection in the equatorial western pacific. World Meteorological Organization, , 415-416. Zhang, C. (1997). Intraseasonal variability of the upper-ocean thermal structure observed at 0 degree and 165 degree E. Journal of Climate, Boston, MA, 10(12), 3077-3092. Zhang, C., Hendon, H. H., Kessler, W. S., & Rosati, A. J. (2001). A workshop on the MJO and ENSO. Bulletin of the American Meteorological Society, 82(5), 971-976. Zhang, C., & Hendon, H. H. (1997). Propagating and standing components of the intraseasonal oscillation in tropical convection. Journal of the Atmospheric Sciences, Boston, MA, 54(6), 741-752. Zhang, C., Hendon, H. H., Kessler, W. S., & Rosati, A. J. (2001). A workshop on the MJO and ENSO. Bulletin of the American Meteorological Society, Boston, MA, 82(5), 971-976. Zhang, C., & McPhaden, M. J. (2000). Intraseasonal surface cooling in the equatorial western pacific. Journal of Climate, Boston, MA, 13(13), 2261-2276. Zhang, G. J. (1999; 1999). The effects of westerly wind bursts and calm conditions on the air-sea fluxes during TOGA COARE. World Meteorological Organization, , 319-320. Zhang, S., Anderson, S., Plueddemann, A., & Weller, R. (1999; 1999). Large scale variability of surface heat flux and upper ocean response in the western pacific during COARE/IOP. World Meteorological Organization, , 251-252. An All-season Real-time Multivariate MJO Index Forecast and monitoring plots of the MJO that utilize and empirically derived structure of the MJO based on historic data. Adrian Matthews MJO page A very complete page with MJO description, current research topics, illustrations and animations from Adrian Matthews at the University of East Anglia. Includes various plots of the current status of the 30-60 day oscillation including OLR anomalies, geopotential height and other animations and satellite photos. Also includes a very nice FAQ on the oscillation mechanism and evolution and it's relationship to other climate processes. They also have a MJO daily index. U of Wyoming MJO tutorial. A tutorial on the MJO with schematics, a brief history and a bibliography on the phenomenon. NOAA/ESRL PSD spotlight articleMJO tutorial. The MJO and it's affect on the onset of an El Niño event. Interactive data plotting and general weather/climate monitoring pages. Includes maps of many variables for many different variables and time scales. Includes links to MJO Composites along with many other climate/weather variables. Choose MJO to get list of high/low MJO activity days. Use these days on the page daily composite page to obtain composites for different variables. Plots time/latitude and time/longitude plots of NCEP reanalysis and operational data. Plots means and anomalies.